Congratulations to all who successfully completed the 2014 Errandonnee! I am still in the midst of tallying the final number of participants, but it currently stands at just over 55. If you sent in your Errandonnee stuff and I did not respond to you by email, that means I did not receive your submission. Please resend it to gersemalina “at” gmail “dot” com. Okay? Okay. The Errandonnee is about riding 12 errands in 12’ish days, and sometimes finding a loophole to get everything done. It’s just like interpreting regulations and policy :). The group of people who tend to do Chasing Mailboxes challenges tend to not take things too literally and don’t mind pressing the boundaries of the rules on occasion. I love the creativity that comes with this challenge. Thank you for your posts, flickr photos, Instagramming, blog posts, and tweets of your various errands. Who knew errands could be so interesting? 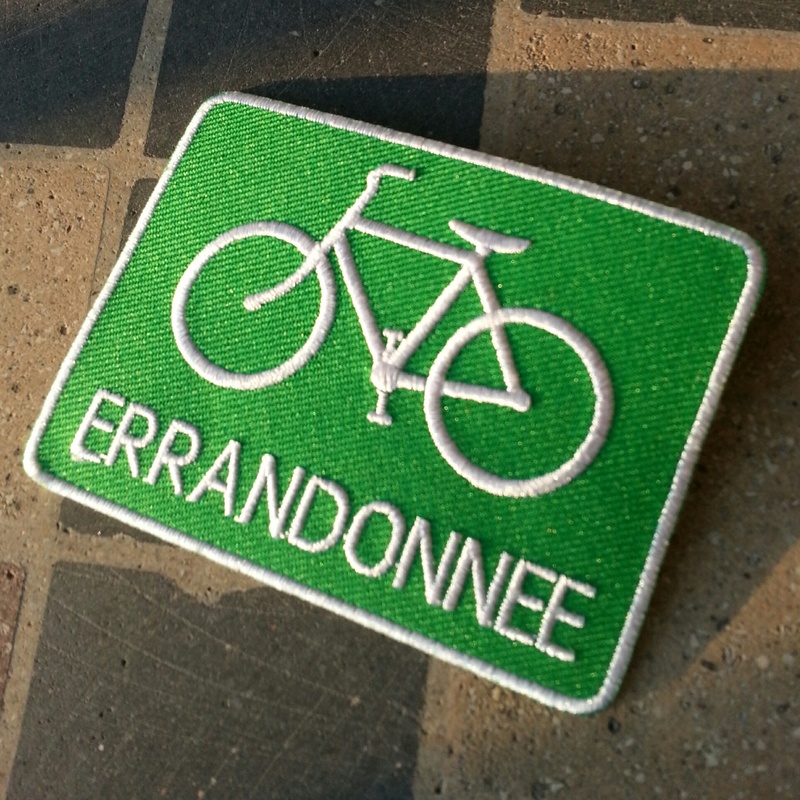 All finishers will receive an Errandonnee patch that looks like the one pictured. 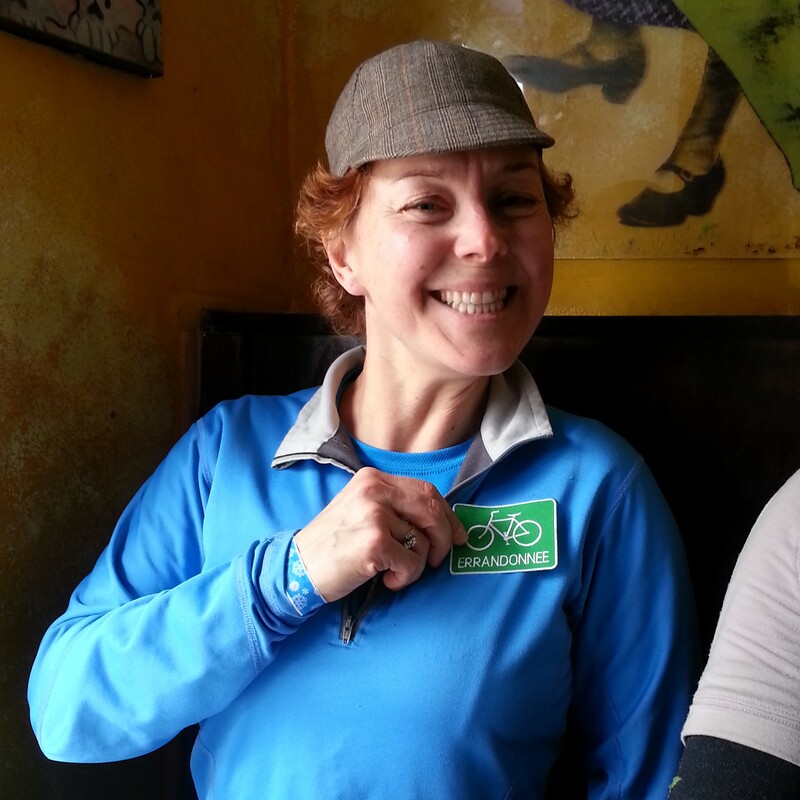 To give you an idea of the patch’s scale, above is a photo of #BikeDC‘s own Ultrarunnergirl modeling it for you. I hope to announce the winners by Friday so I best get busy homologating Errandonnee results! Great looking patch. I have no good excuse (compared to all of you in the snow) for not completing. However, I’m looking forward to the next challenge. I love it! Now, how to decide where to affix it? I may need a special new Carradice bag to put it on…. OMG, you’re homologating again! I thought that medication you were on took care of that. As your doctor, I prescribe a long bike ride on a warm spring day. Wow! What could be better than cool free stuff for simply riding your bike to places you were going to go anyway. That’s way better, and better for you, than the free cigarettes that my dear Uncle Jim got when he was in the Air Force during World War II. Ooooh, very nice! I hope my “creative” category interpretations didn’t disqualify me. Just discovered these challenges can’t wait to participate next time. It’s true! All of these are possible! Fortunately, I did not experience any of these while homologating the Errandonnee. I love the patch!!. Being a practical person and knowing how the world works I understand that the patches must have cost you something. Do you want anything to help defray the cost a bit. Good color! I still haven’t decided where to put my coffeeneuring patch, but this is going to look great on my frame bag. Excellent challenge. Does commuting to work count as an “errand”? HAHAHAHA! I believe it has to count as a errend or the event would have to be retitled Drudgeonnee and it just does not have the ring.